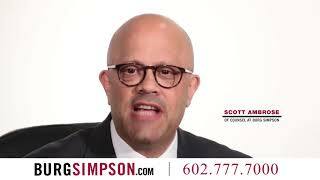 WHY SHOULD YOU CHOOSE BURG SIMPSON? If you have been seriously injured due to the negligence of another party, you should contact a personal injury lawyer in Denver as soon as possible. You can speak with an experienced personal injury attorney at Burg Simpson today by filling out a FREE Case Evaluation form, or by calling us directly at 720-500-5995. 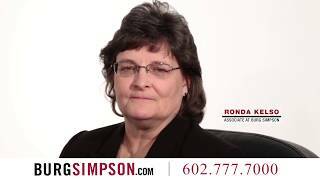 Burg Simpson has been fighting to protect our clients’ rights and getting results for over 40 years. During your free consultation, you will learn how the Colorado personal injury lawyers at Burg Simpson can provide you with the support and guidance you need to obtain the compensation you deserve. YOUR COMPENSATION: What is your case worth? THE LEGAL PROCESS: We will file your case, and deal with the insurance companies for you. THE TIME FRAME: We will act quickly to obtain the critical evidence we need to help you. It is important to call Burg Simpson as soon as possible. The longer you wait to talk to an attorney, the longer it will take to secure damages for your pain and suffering. Have you sustained an injury in a car accident and need a lawyer? Did you slip on some spilled milk and fall at the grocery store? Or has something else left you injured? In a court of law, a personal injury is defined as any harm done to someone by the act – or failure to act – of another party. This can include a physical injury, damage to one’s reputation, the loss of a legal right or even one’s emotional well-being. That injury can be further classified as willful (intentional) or negligent. Personal injuries can be caused by drunk driving accidents, semi-truck crashes, and other catastrophic events. These kinds of accidents can have life-changing consequences that result in traumatic brain injuries or spinal cord injuries. If you have experienced an injury through the carelessness of another party, you could be eligible for damages for your pain, suffering, and loss. The Denver personal injury lawyers at Burg Simpson have over 4 decades of experience fighting for personal injury victims. We have also won over 100 cases in excess of 1 million dollars each, totaling a billion dollars. When you call a Denver injury lawyer at Burg Simpson, you can be assured that your attorney has the experience you need to protect you and get your life back on track. Click here to see some examples of our PERSONAL INJURY CLIENT RESULTS. It is also important to know that if we take your case, you do not have to pay us anything up front. We only get paid if you do. Get in touch with our personal injury lawyers in Denver at 720-500-5995. Do not speak to anyone from the other party’s insurance company. Do not provide any sort of recorded or written statement. And do not sign anything for anyone, even your own insurance company, without first speaking to your Denver injury attorney. Even if someone is offering to pay your medical bills, again, do not sign or accept anything without first talking to your personal injury attorney. Personal injury cases can involve one or more of the insurance types listed above, which makes it even more crucial that you speak with an experienced personal injury lawyer in Denver as soon as possible. Your lawyer will act as your informed advocate to protect your rights in the face of insurance companies who are only looking out for their shareholders best interests. Burg Simpson’s attorneys have the knowledge and experience you need to help you through this complex legal process. We are here to protect you and your best interests. The sooner you get help from a Colorado personal injury lawyer, the better your chances of securing compensation. If you find yourself in urgent need of a car accident injury lawyer, it is crucial to start your case immediately after the personal injury occurred. So contact Burg Simpson today to speak with an attorney and have your questions answered during your free consultation. Personal injury cases can take time – lawsuits and legal negotiations are not rapid endeavors. The legal system is methodical by design. Although legal issues can be settled quickly, it may take months or even years for personal injury cases to make their way to resolution, especially when you are dealing with insurance companies. Burg Simpson’s personal injury lawyers have dealt with dozens of insurance companies and hundreds of cases, so we are fully prepared to walk you through what can sometimes be a frustrating, time-consuming process. One of our paralegals will most likely interview you before you meet with one of our personal injury attorneys. Our trained legal professionals will ask you several questions to better prepare you and our staff for your initial consultation. This might take the form of a personal meeting in our office or a phone call, depending on the severity of your injuries. Our injury lawyers are also willing and able to meet with you at a medical facility, if necessary. These consultations can sometimes be emotional events, so it is completely understandable for you to bring a family member or loved one to your meeting with one of our Colorado personal injury attorneys. If you have been in a car accident and need an injury attorney, It is natural to have questions and concerns in the aftermath of a painful, traumatic event, so we have provided a Personal Injury FAQ to help address some of your immediate questions. But to thoroughly understand the extent of your legal matter, you should consult with a personal injury lawyer at Burg Simpson. Call us for a free consultation at 720-500-5995, and allow one of our experienced personal injury lawyers to answer all of your questions. No matter how severe your injury, our personal injury lawyers are here for you! 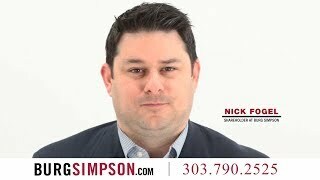 Burg Simpson will help you through the details of your incident and case, even if it is brought to trial. Fill out a FREE Case Evaluation form today or call us before it is too late to discuss your situation with a Colorado personal injury attorney!